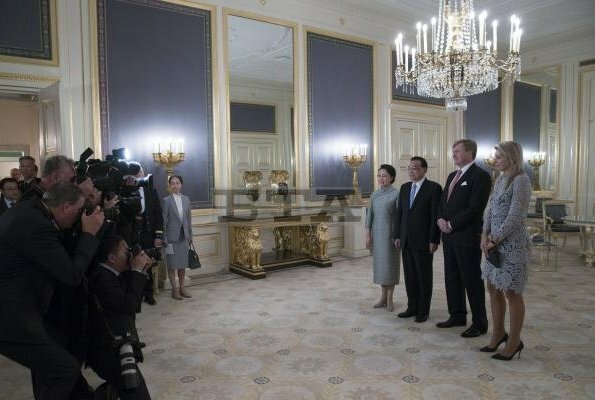 On October 15, 2018, King Willem-Alexander and Queen Maxima received China's Prime Minister Li Keqiang and and his wife Cheng Hong at Noordeinde Palace in The Hague. 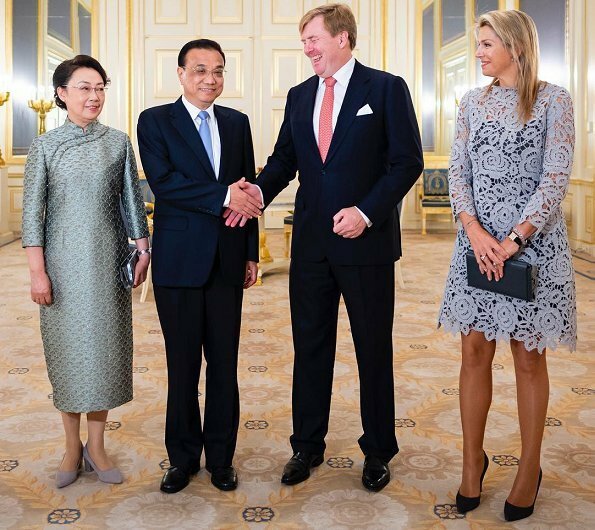 Premier Li Keqiang arrived in Amsterdam, the Netherlands on Oct 14 for an official visit to the Netherlands, the first by a Chinese premier in 14 years. Prime Minister Li will address the Sino-Dutch business forum and attend various meetings. I believe it's in their culture not to be flashy. I don't like the style of her (Chen Hong) dress but I've seen worse. Looks like they agreed on matching colours & not wearing hats. Queen Maximá always looks great. Doesn’t anyone understand that THIS is her hair? The other hairstyles are extensions and additions. Nevertheless, she is beautiful, has wonderful sense of style and is charming and regal. Of course this is her hair and other, nicer, up-does are extensions, but what does it matter really? Hair is very little artificiality if compared to some other royals who have lots of botox and surgeons. I actually wish she would wear for example extension ponytail to these days her hairdresser is out of town days to avoid this useless weeping how poor her hair is. All people do not have thick and beautiful hair and if they do not, there is not much to do. Don't you understand that she is a queen and she should be well groomed at all times? She may be charming but her hair is no regal at all, IMHO. Nin Pujol, her hair does not stand all that grooming she is having now, if she had even more often well made up-does she would be bald now. I think she has so many up-does her hair can stand now. Of course it would be better if she left that blond look and stay darker as she is, but on other hand people in Netherland like her being blond. It is also very unfair to say her hair is no regal at all, I think she has half the time just amazing up-does made with extensions and what looks very good. This dress is a big no for me, too short and odd seeing the dark piece underneath it. Yes, this is her hair. But would look so much better if it were curled, or styled, or conditioned. I think a chignon would look so much better. It looks like the hair extensions are severely damaging her hair. The dress is too short and the dark lining makes it look cheap which I’m sure it wasn’t. or even BRUSHED! And out of her face. It's an insult to their hosts that she can't keep her hair tidy. Southernbelle; such extensions she is wearing which are not permanently at her hair do not damage her hair. You just put them on when making up-doe and take away before washing hair. What does damage her hair are bleaching, hair-sprays and other chemicals used when hair dressing. Thanks for explaining! I feel bad for her as it’s in the worst shape ever right now. How can hair be an insult? Where does this come from? This is the most bizzare logic! Her hair is her hair. I don't think it looks great most of the time, but it does not change who she is as a person or the job she does. She is a very striking woman with amazing fashion sense. This one, though, is a miss for me. As mentioned by Nin Pujol, the Chinese prime minister's wife dress is lovely. I don't mind the length of the dress but think the piece under it needs to be the same shade as the dress. Hair would be better up. I like the Chinese PM's wife's dress. mooi kleedje maar te kort en het kleed van de andere dame mocht 10cm korter zijn. I am done with too short lace dresses. Just an updo would have been an instant upgrade. It looks as if she knows only about lace dresses in these days. Yes a bit too short for her morphology, and her hair could be better but has been worse. Me resulta monotono tantos vestido con encajes, todos tiene el mismo corte, solo cambia el color. cambiara de peinado, se vistiera mas moderna, de manera mas adecuada si el evento es por la mañana,por la tarde, actualmente ya por la mañana va vestida como para asistir a una boda , resulta recargado . The dress in itself is pretty,,but this dark slip or what ever it is underneath is not so nice and a bit to short.Maxima can do better. She does wear a lot of lace lately. Quite a lot. I see that the dark lining is not working for most here, but it is in style. I think I would prefer the dress be longer considering who they are with. This is not lace, it looks like a table cloth- I do not like.